Cute caricature, no? I found it on the web but I don't know who the artist is. It might have been used on published score sheets by Bach. Anyway let me share to you music that I enjoy listening to... I just love the sound of the pipe organ. They can sound glorious and heavenly, and sometimes really creepy. Naturally, one would be reminded of old churches and grand weddings (or maybe even horror films) upon hearing this enormous instrument. 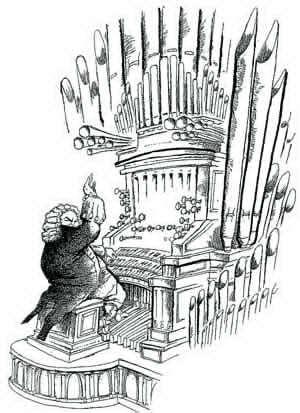 Bach composed numerous liturgical pieces for the pipe organ but he also whipped up nice melodies that are not too, well, churchy hehe. Those fugues, sonatas , and symphonies that will make you think of old European palaces and courtyards instead. Below is a 1996 album of 12 works by Bach performed by German-American organist Wolfgang Rübsam.